Heat the olive oil in a large frying pan over medium to high heat. Meanwhile roughly chop the onion and mince the garlic. Add the onion and garlic to the frying pan and cook for 5 minutes until the onion is soft. Next add the mince to the frying pan and cook, until it has browned, breaking up with a wooden spoon as you go. Stir through the chilli, cumin, oregano and canned tomatoes. Bring the mixture to boil and then reduce heat to simmer for 10 minutes. It probably won't need it, but If the mixture looks a bit dry, just add ½ cup of water. Finally stir through the baby spinach and kidney beans until the spinach has wilted and kidney beans are warmed through. 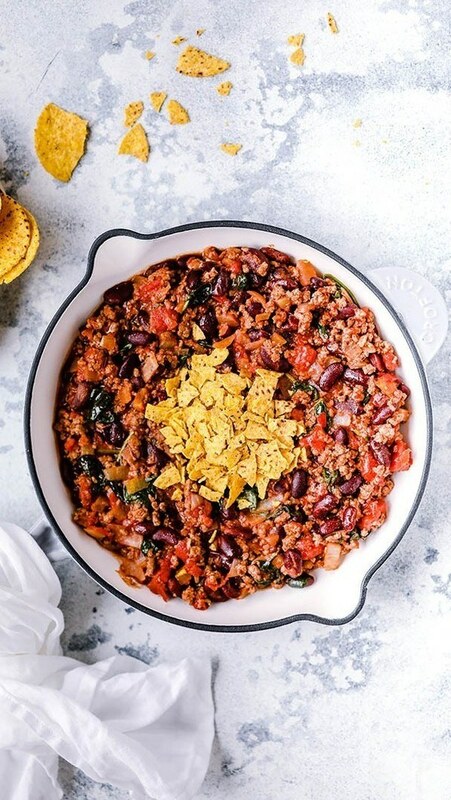 Divide the chilli between two bowls and serve with a big handful of corn chips.